presidents race video | Let Teddy Win! A race that was otherwise free of gimmicks got briefly ugly Wednesday night at Nationals Park. Just after George Washington passed Teddy Roosevelt in the right field corner, Abe Lincoln came from behind and slammed Teddy into the wall, knocking off Roosevelt’s glasses. 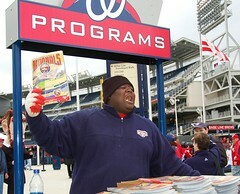 The race also marked the first appearance of the “new look” presidents at Nationals Park this season. They first made their appearance after the 2010 all star break, but had not been used in an official race this year. No comment from the team on when or why the “botox” presidents are used. I will post more later today, but suffice to say the grand opening of our new Nationals Park was nothing short of a smashing success for every Washington Nationals fan in attendence. Every Washington Nationals fan, that is, except Teddy. Though Ryan Zimmerman’s walk-off home run thrilled and delighted the crowd, our great and much misunderstood 26th president disappointed his loyal fans once again. Whether he was trying to cheat or was just confused about the rules is uncertain; but while George, Abe, and Tom began their sprint along the warning track, Teddy simply shot across center field. Had he not stopped to chat with a couple of members of the Atlanta Braves outfield, Teddy might have beaten George across the finish line, though whether he would have been disqualified remains an open question. George’s achievement as the first racing president to win the presidents race at Nationals Park has been reflected in the newest section of letteddywin.com — the Presidents Race Standings page, which will continue to be updated throughout the season.